Last week Ipswich Rotary and the Ipswich East Rotary Club of Ipswich, UK celebrated a long tradition of biannual exchange visits and friendship. The week long visitation of the Ipswich, UK club to Massachusetts marked the 18th such visit spanning almost 40 years, every two years since 1988. Among the traditions of Twinning is for the visiting club to make a significant donation to improve lives in the host community. This year, Ipswich East, UK donated a new custom crafted counter with a built-in electronic scale to the Ipswich Open Door food pantry. 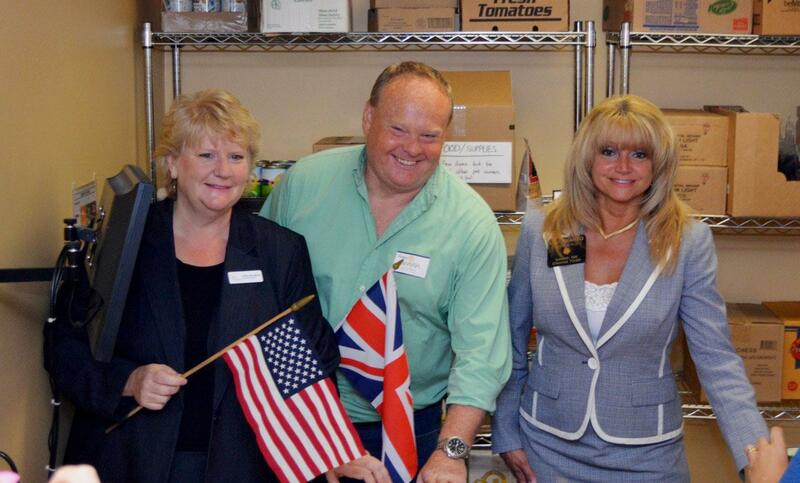 Active support of the new, expanded food pantry is a major commitment of Ipswich Rotary. Twinning guests stay with host Rotary families during their visit. Over the years, many lasting friendships have been formed. In addition to the Open Door gift ceremony, some of the activities this year included a trip to a Red Sox game, a tour of the State Capitol led by Representative Brad Hill and Senator Bruce Tarr, a tour of Boston on a Duck Boat, a clambake, and a tour of Ipswich. The Sox won a well-played game 5-4 and Ipswich East team leader, Mark Murphy, and our own District Governor, Sheryl Meehan appeared on the Jumbo Tron while being honored on the field. Since it also was Rotary Night at Fenway, a large group of District 7930 Rotarians joined them to cheer on the home team.